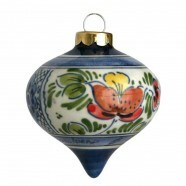 Absolute Top Quality polychrome Delftware ceramics with various christmas ornaments like christmas balls, short drip balls, long drip balls and bells. Different decorations with Flowers, Holly leaves and more. Authentic Delftware handpainted by the famous pottery M. de Wit. All articles are signed with the typical M. de Wit mark.